"Consumers have an alternative to cable with My Omnibox," says Jason DeMeo, CEO of Omniverse One World Televsion. 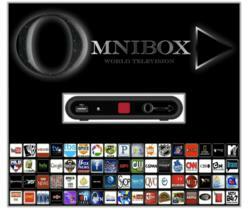 My OmniBox is an IPTV set top box debuting this September in thousands of Retail Stores, Direct Sales, Amazon, National Direct Response Advertising, and via http://www.myomnibox.com. My OmniBox is compact and portable, empowering the viewer to watch what they want to whenever they want to either by taking the OmniBox with them or utilizing the OGO Mobi App for their handheld devices available on all Android Operating Systems and on Apple products launching this fall. My OmniBox is only 0.8” in height, 4.0” wide, and 3.5” deep. “The Box has the end user in mind with features that can service a larger group of people by removing the restrictions that only engage the elite,” says Jason DeMeo, CEO of Omniverse One World Television. Some examples include - 1080P HD Streaming, multiple screen resolution to service virtually any TV including 480i, 576i, 720p, 1080p, 1080i. Both HDMI and AVI connections, and 802.11 “g” or “n” WiFi. Streams have multiple bit rates to service slower Internet speeds if needed and you can "Network Share" your Videos, Music and Photos from your computer right to your television with the OmniBox. DeMeo added, “You can also enjoy many applications such as the NBA, ESPN, TZM, AOL, MLB, NHL, Crackle, Google News, and many more, plus hundreds of the worlds top radio stations, over 26,000 Video on Demand and Podcast with genres including Sports, Lifestyle, Health and Wellness, Business and Finance, Kids and Family, Education, Celebrity News, and Video Games just to name a few. Additional features include Web Browsing on your TV, Social Media Interaction, Email, and more. My OmniBox empowers your TV with endless possibilities..."
Omniverse One World Television empowers Producers, Content Rights Holders, Syndicators, and Broadcasters large and small to effectively monetize their content through a Multi-Media Platform which covers all 211 domestic markets, worldwide markets, has unlimited channel capacity, and allows for very low broadcasting costs allowing us to transfer those savings to our subscribers. My OmniBox is built to allow the viewer to Watch what they want to - On the device they want to - Whenever they want to.